Feeding logs from various AWS services to CloudWatch Logs is a common pattern. From Lambda logs, through ECS Task logs, to Linux /var/log/* messages forwarded by awslogs daemon, they can end up in CloudWatch. How can we monitor them – and get alerted – when something of interest gets logged? People often use Elastic Search, Splunk, Graylog or similar heavy weight solutions. But do we really need that? Very often all we want is to know when a certain keyword, e.g. “Error”, appears in the messages. Luckily that’s very easy to do. CloudWatch Logs support notification Filters – when a pattern of interest (e.g. the keyword Error) appears in one of the log group’s Log Streams the Filter can trigger an action, e.g. send the matching record to a SNS topic. Such an alert is usually quite terse – just one matching line from the logs, no context and all that wrapped in a JSON format. It’s not something you’d want to send to your support team. However we can leverage the built-in Filtering functionality and with a bit of Lambda coding generate a lot more user friendly alert emails. 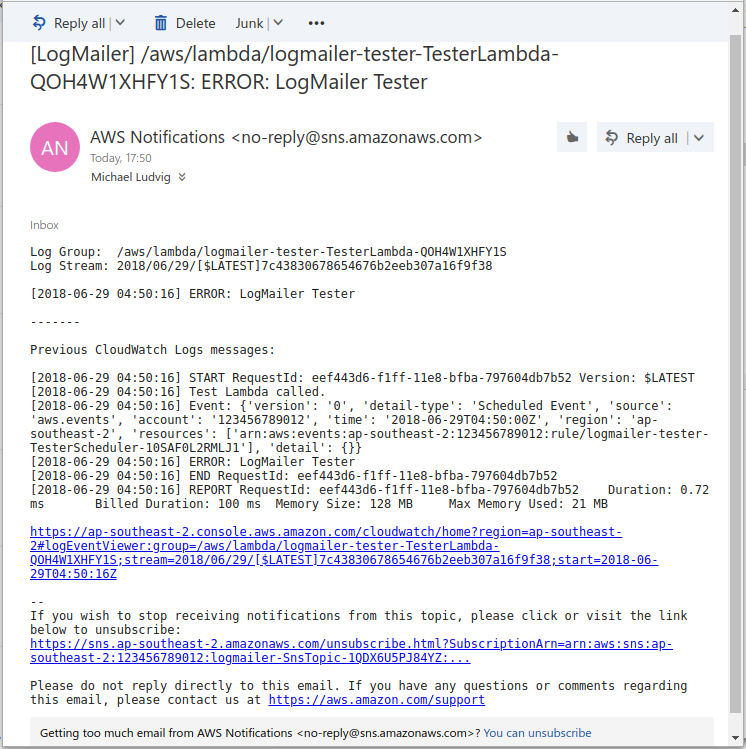 CloudWatch LogMailer is a simple Lambda function that gets called when a message in the monitored Log Group matches the specified Filter. 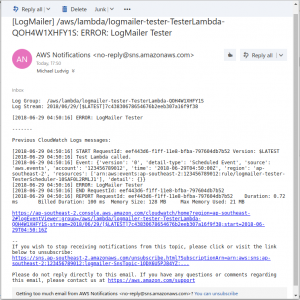 The Lambda then downloads the last few messages from the matched Log Stream to provide some context and emails it to the Operator. It’s completely serverless, low-maintenance and very low cost solution for simple log monitoring. Log Group with Log Streams from your logging source (e.g. Lambda function). I like to deploy all my stuff using CloudFormation because it facilitates reusable, reproducible, all-or-nothing, easy-to-delete deployments. This is the actual Lambda function written in Python. CloudFormation template that creates all the infrastructure (Lambda, SNS Topic, IAM Roles, etc). The Lambda code is embedded in the template for convenience. Note that the actual LogGroup that we want to monitor is not part of this template. The idea is that you’ll have one central Log Mailer lambda function and use it to monitor many different LogGroups in your AWS environment. FilterPattern: "?ERROR ?Error ?error ?FAIL ?Fail ?fail ?FATAL ?Fatal ?fatal ?Traceback"
Put these three resources in each CloudFormation template and you'll have get a low-cost, low-maintenance log monitoring solution.